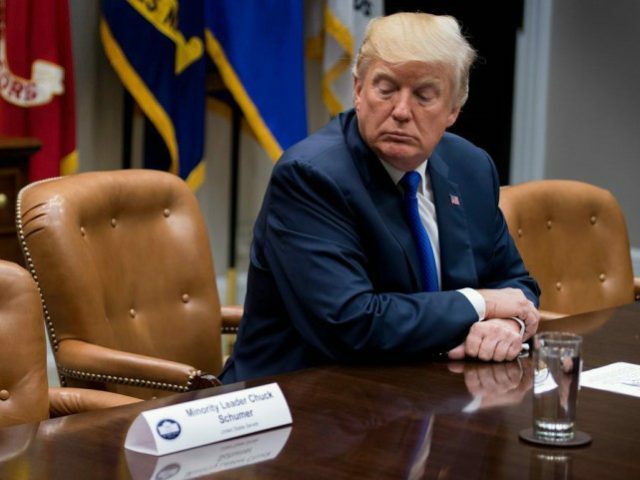 President Donald Trump boasted that the Democrats were giving him a political gift after they voted against a bill that would fund the government late Friday night. “This is the One Year Anniversary of my Presidency and the Democrats wanted to give me a nice present,” Trump wrote on Twitter with the hashtag #DemocratShutdown. Trump challenged Democrats for focusing more on amnesty for illegal immigrants than funding the government. On Friday afternoon, Trump met with Senate Minority Leader Chuck Schumer over cheeseburgers at the White House to discuss a possible deal, but it was ultimately rejected. The president urged Americans to vote more Republicans into the Senate in 2018 to push forward his agenda. For those asking, the Republicans only have 51 votes in the Senate, and they need 60. That is why we need to win more Republicans in 2018 Election! We can then be even tougher on Crime (and Border), and even better to our Military & Veterans!